This eyeliner is pretty great. I used it yesterday and while at first it seemed like it wasn't going to apply, I rubbed the fresh tip on my finger to loosen it up and it applied smoothly. It takes a few back and forths to get a dark colour, and while that was somewhat annoying, it looked great and sharp once it was done! It last throughout almost my entire workshift and the whole rest of the night (from about 3:30 pm applied, to 1:00 am removed) with hardly any smudging or general wear removal at all! Don't get me wrong, it was there - it's not perfect. But it was minimal. The pencil is really thin, and at first that worried me about the ease of application, but it did just fine! While I don't use it, I also think it's pretty handy it comes with a built in smudger and the built in sharpener for the twist pencil is much appreciated. I'll definitely continue using this, but as to whether it becomes my regular eyeliner replacing the Rimmel London I've relied on for so many years - We'll have to see. 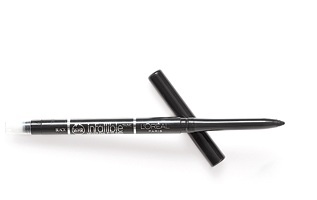 This eyeliner is perfect all of the time. It does not smudge, and it gives excellent coverage. I do not know how I have worn make up without it.